Interested in building a new custom home? Consider these top benefits that may help you in making a decision. To some, custom homes are truly a symbol of taking control over your living space and pursuing freedoms in life. Not everyone is aware of how a custom home can completely change your daily life though. It’s easy to settle for a prebuilt home, move in, and realize that something about it just isn’t right. Those little features or even floor plan decisions may not stick out compared to big requirements like the number of bedrooms or bathrooms, but once you’re moved in, they can start to take a toll on your patience. Below, we look at four of the biggest benefits of building a new custom home. Building a custom home is quite literally all about starting from the ground up. You can voice your need and have complete influence over the size and floor plan of your home, as well as all of those little features that make it feel just right for you. Your options here are nearly limitless and you can find ways to truly express not just what functions for you, but what aesthetic is yours. Purchasing a home from someone else means you’re inheriting some kind of baggage. There may be issues regarding the upkeep of the home or those little hidden details that you won’t realize initially even after a home inspector takes a look, but even if not, there’s something special about moving into a new home that hasn’t ever been lived in. 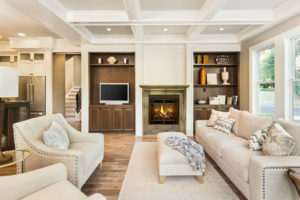 A custom home offers you the knowledge of every little design decision and how those decisions were made, so you’re never left with frustrations over what feels like a poor design. If you’re purchasing a new home, you’re already making a large investment. You’ve already made the decision that you want to purchase a new home, so why not get the most out of that investment by feeling confident in what you’re spending your money on? A completely new, custom built home means you can take advantage of the latest and greatest. This means all of those energy efficient building materials and appliances, all of the smart tech that’s out there, and everything else that even a year old home may not have. This entry was posted on Friday, March 29th, 2019 at 12:31 pm. Both comments and pings are currently closed.